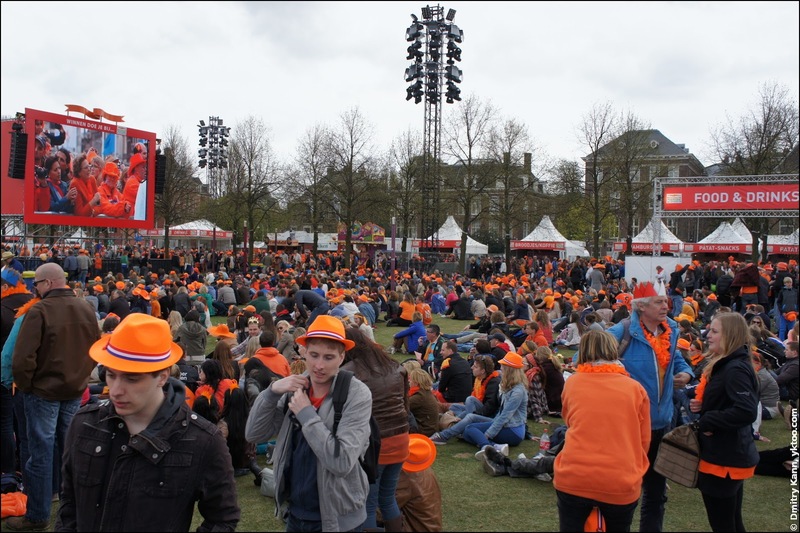 Yet again, precisely on time, Holland has turned orange on the 30th of April. 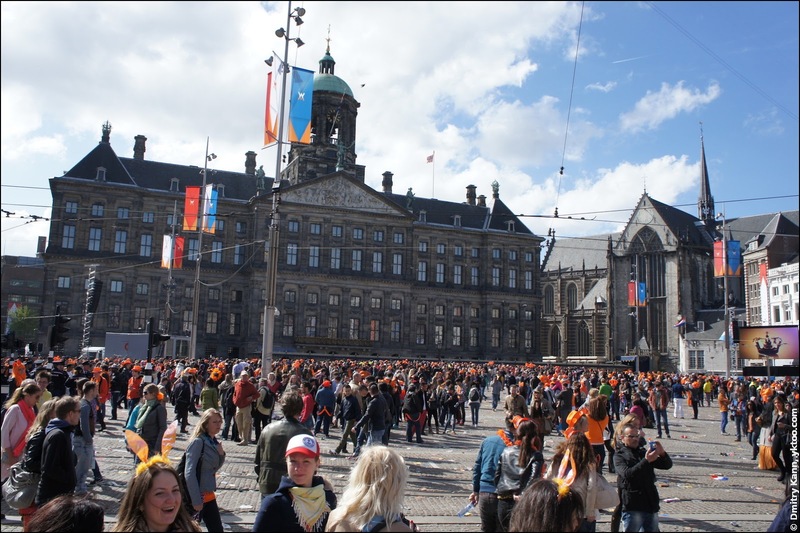 Queen's day is there, but this time is the last in the modern history of the country. 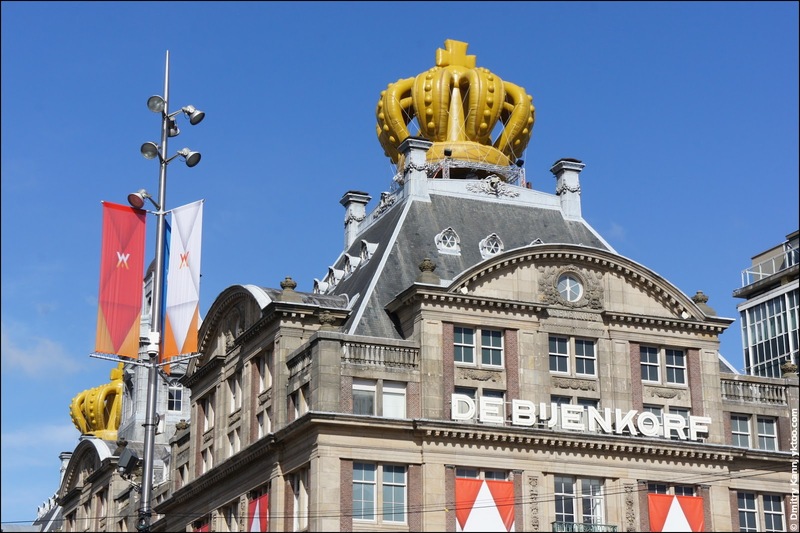 On the 28th of January Beatrix announced that she would abdicate in favour of her eldest son Willem-Alexander, the heir apparent to the throne. After 33 years of service it's time to say goodbye, said she (to put it in simple temrs, the actual speech was of course more florid). 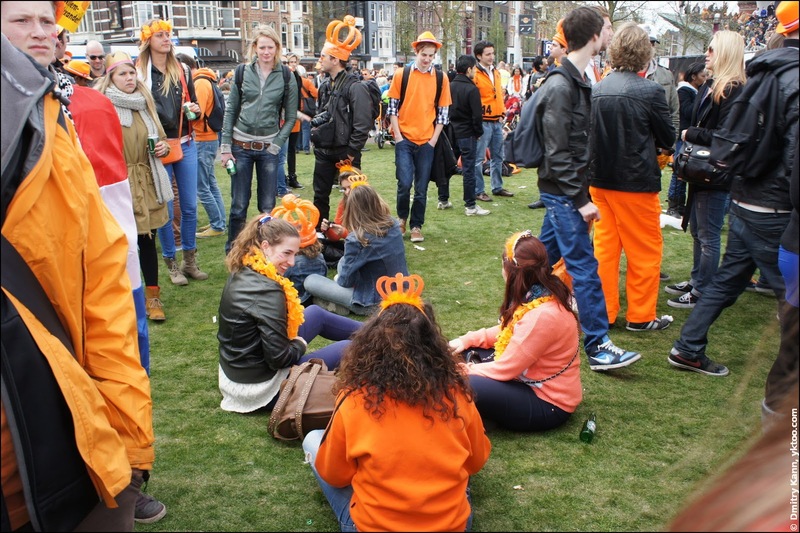 No queen means no Queen's Day, it's that simple. 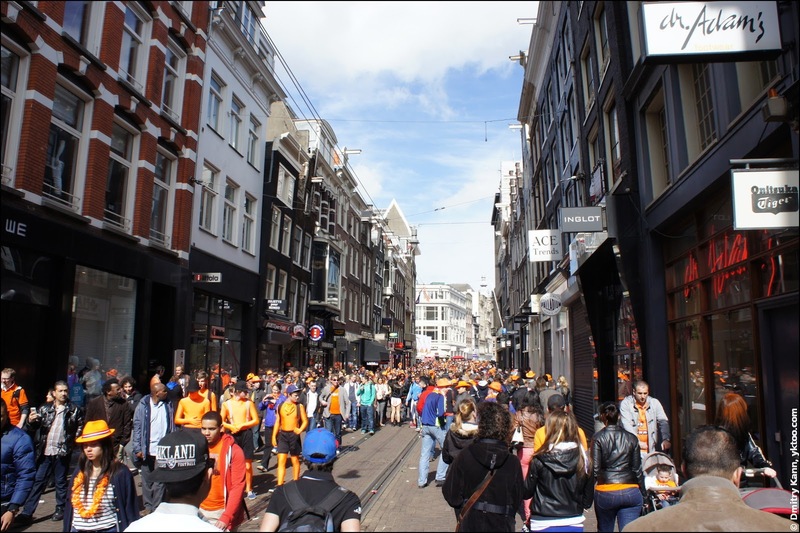 As of 2014, this holiday will rather be celebrated as King's Day (Koningsdag). 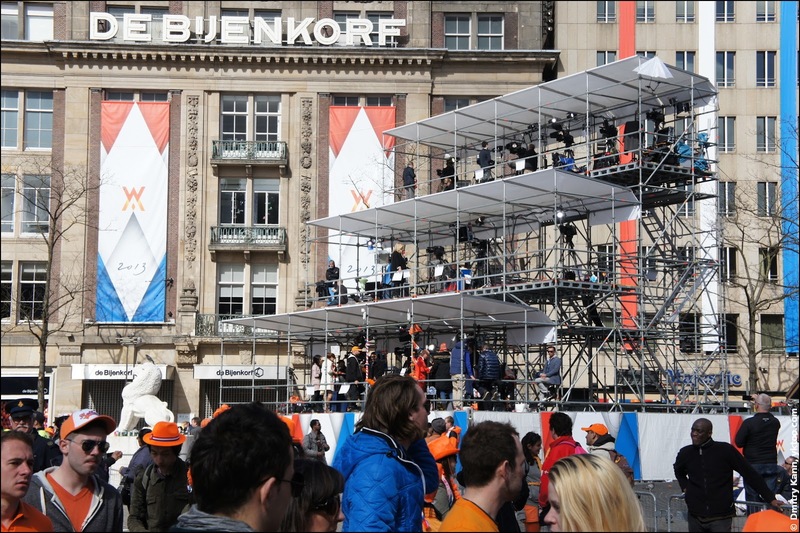 Willem-Alexander was fortunate to have been born on the 27th of April, which is almost the same date. By contrast, Beatrix's birthday is on the 31th of January, which means winter and cold. When she ascended the throne in 1980, she decided to keep it as it was on April 30th. 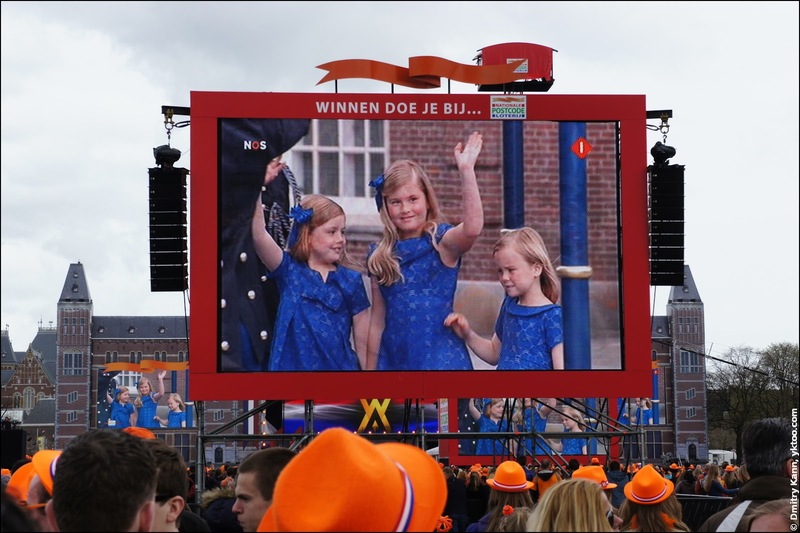 So Beatrix turned a princess again, Willem-Alexander the King and his nine-year old daughter Amalia a princess and the heiress apparent to the throne. 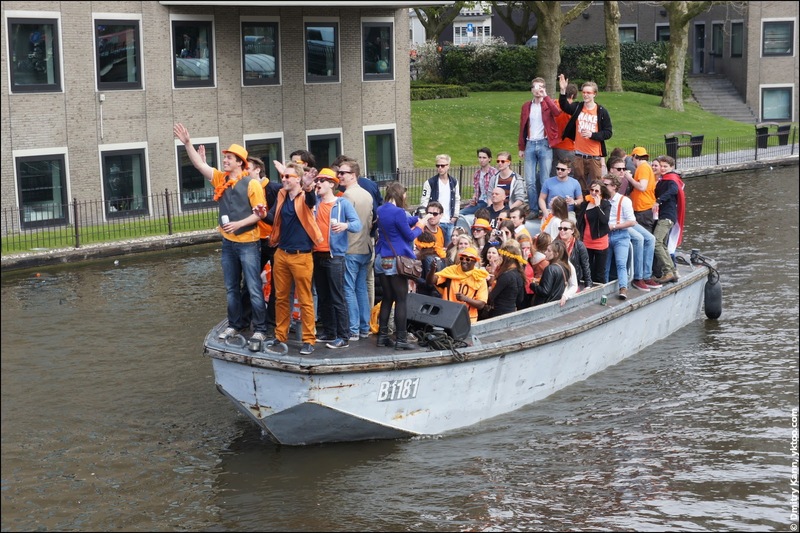 This Queen's Day was special not only because it was last. 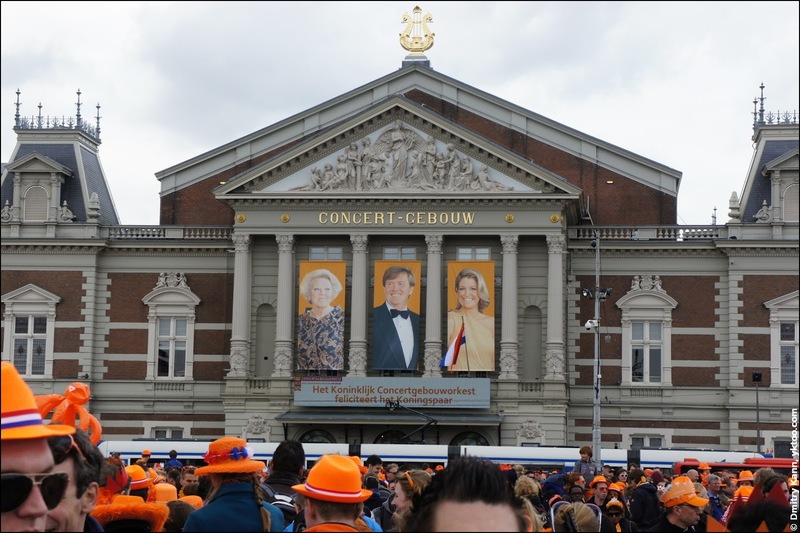 Its main highlight were the abdication of Queen Beatrix and the investiture of the new king. 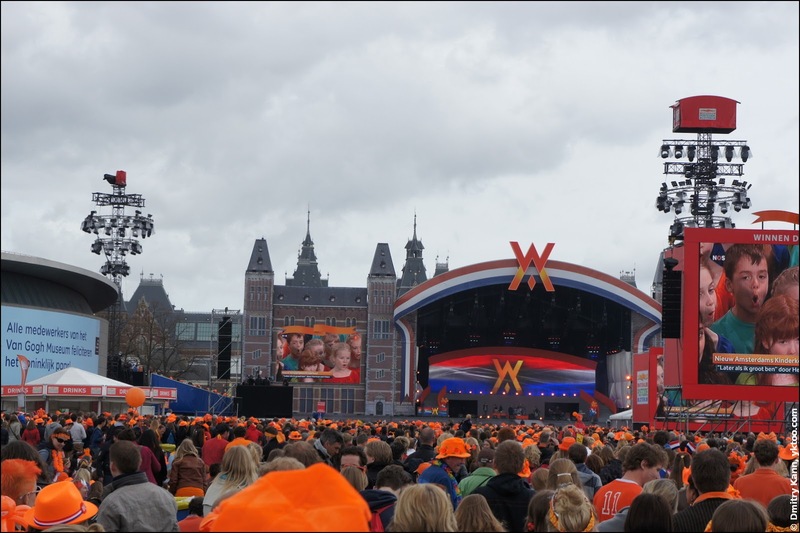 The ceremony began at ten o'clock in the morning on April 30th at the Royal Palace on the Dam Square, Amsterdam. The Queen signed the Instrument of Abdication in the presence of numerous officials at 10:07. 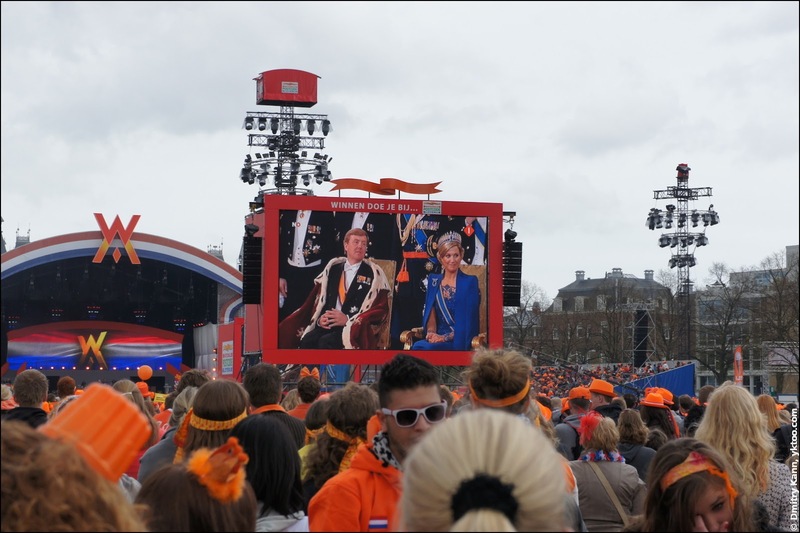 As of that moment Willem-Alexander became the reigning King of the Kingdom of the Netherlands, and his spouse Máxima a queen consort (meaning she is appraised as a queen though formally she is still a princess). 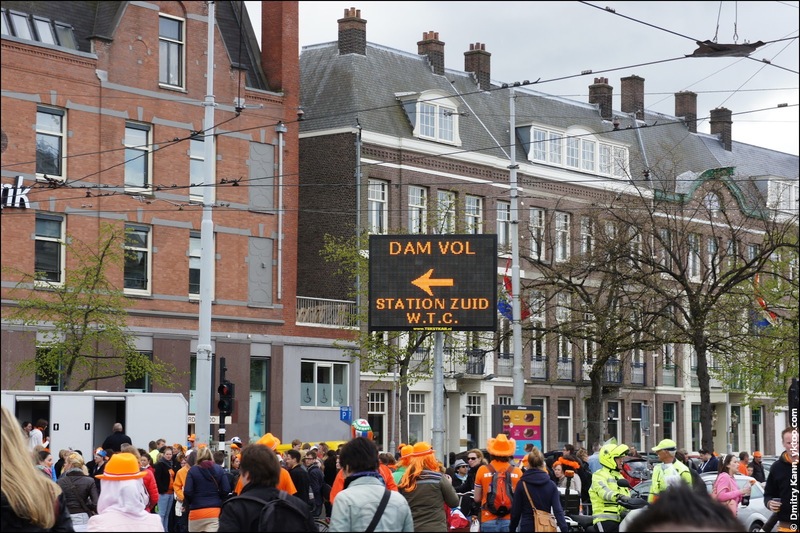 The idea of turning up to the Dam Square before ten in the morning was considered unfeasible. Looking for a parking place would become a highly non-trivial exercise. And you wouldn't want to come to Amsterdam by train as it was forecasted at least a million people would come to Amsterdam that day, both from Holland and nearby countries. 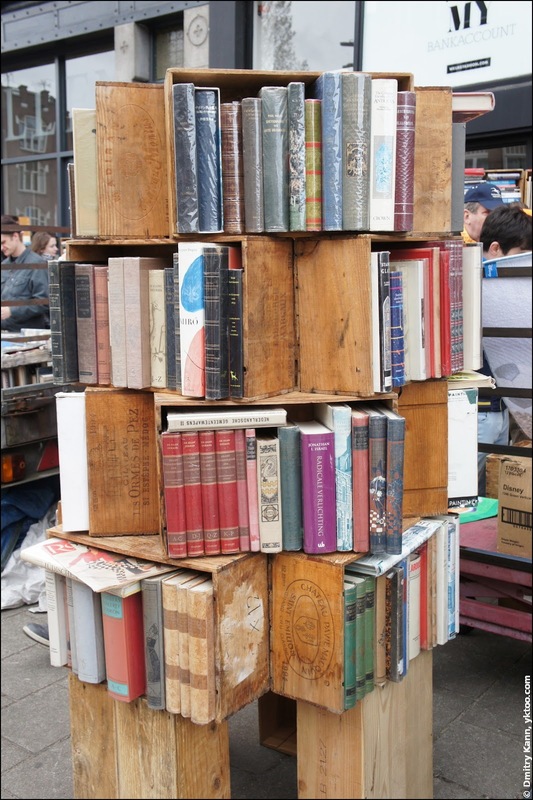 One of my Dutch friends has done this. 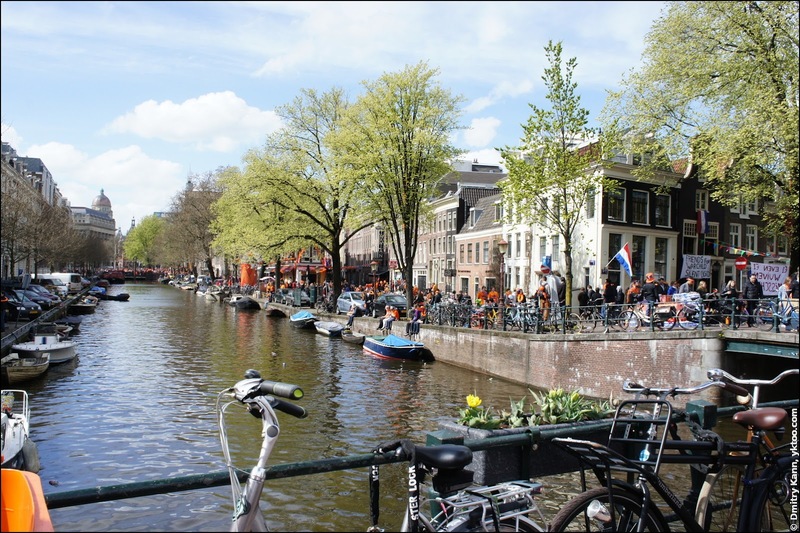 She had to get up at six and take public transport, which was doable since she lives close by Amsterdam. 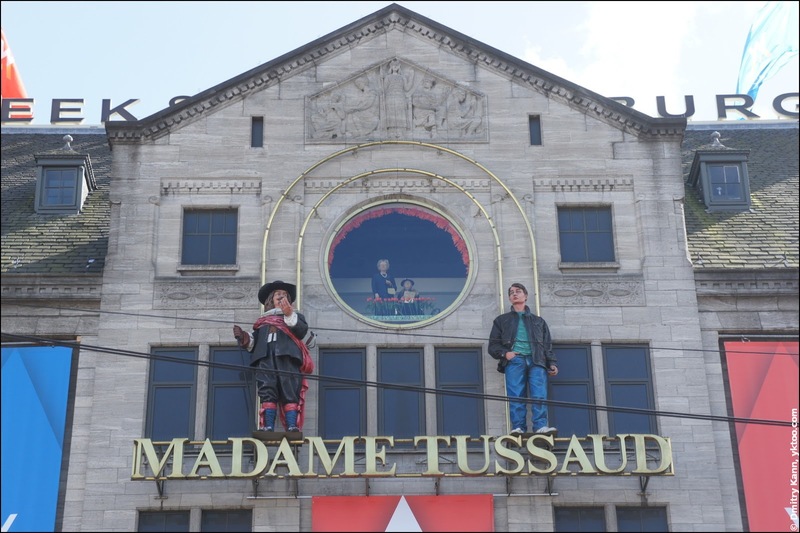 Another thing to remember about such events is that it's hardly possible to see anything when standing among Dutch unless you're at least two metres tall. 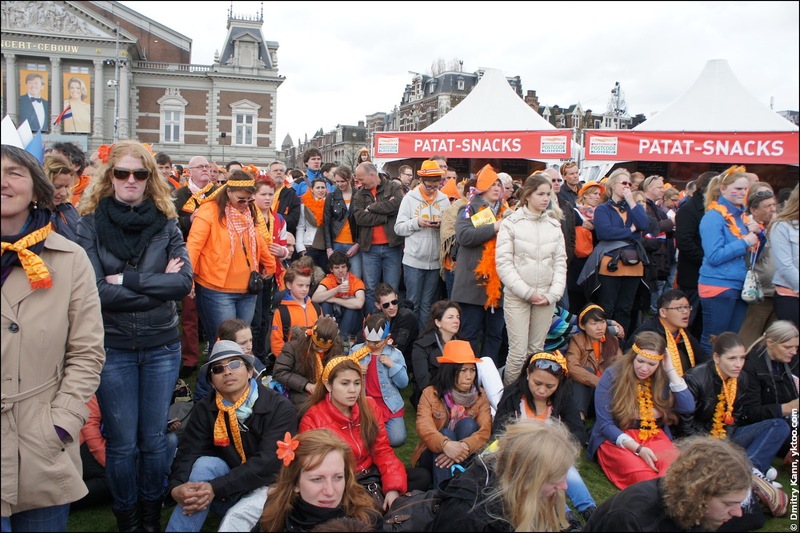 All in all, we've decided to make no haste and arrived at the Museum Square (Museumplein) in Amsterdam around two o'clock in the afternoon. The inauguration ceremony in the New Church (Nieuwe Kerk) has just began. The weather wasn't as favourable as it was a year ago. 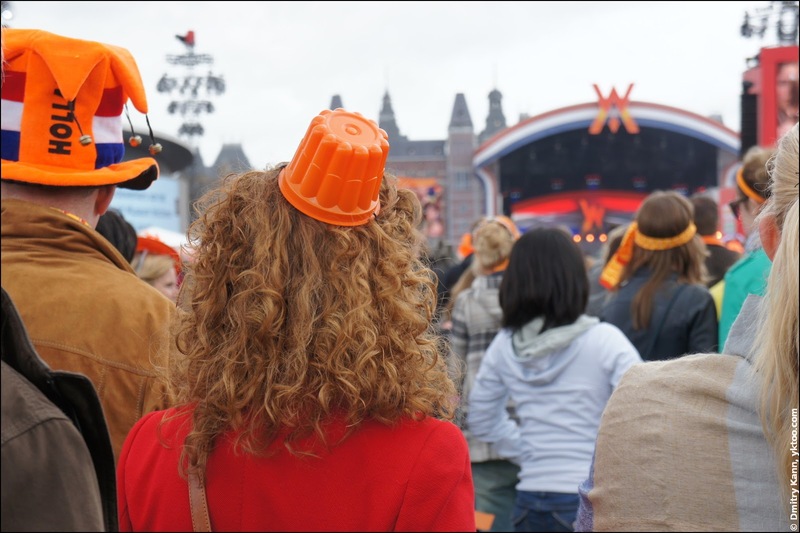 It was cloudy and windy most of the time, so there was not so much orange except hats. 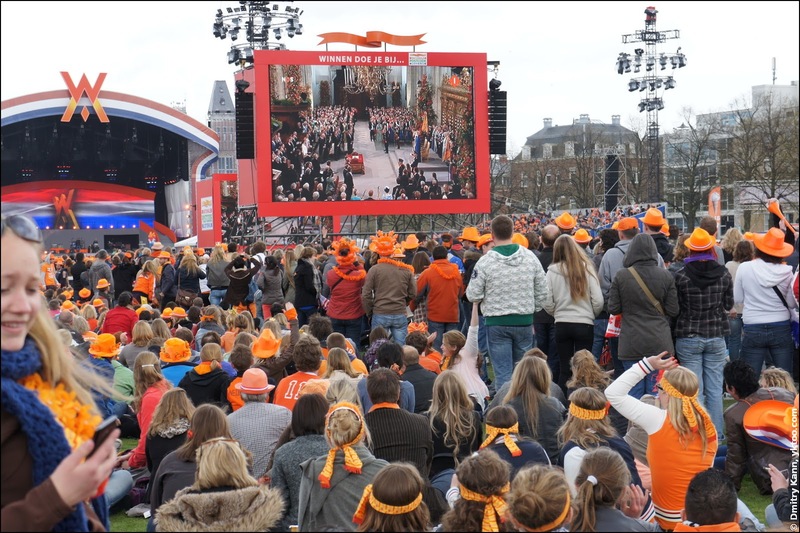 There were several huge screens mounted at the square, showing what was happening in the church. 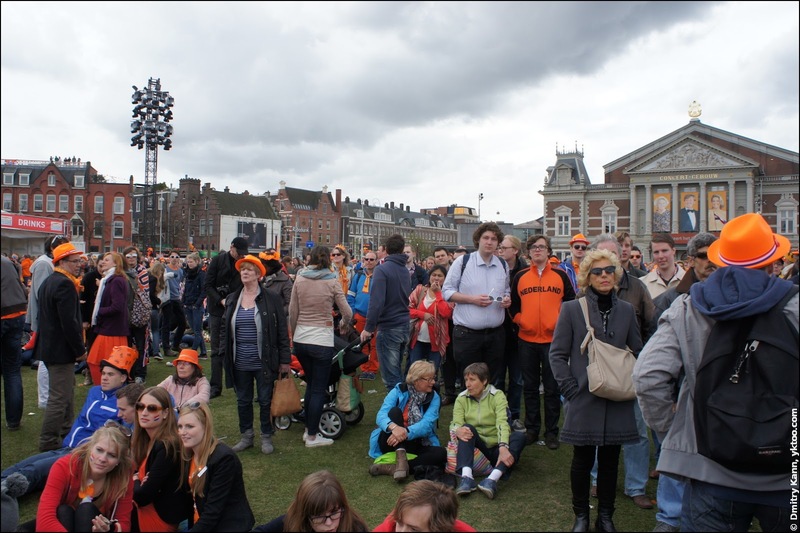 The public watched standing and sitting on the lawn. 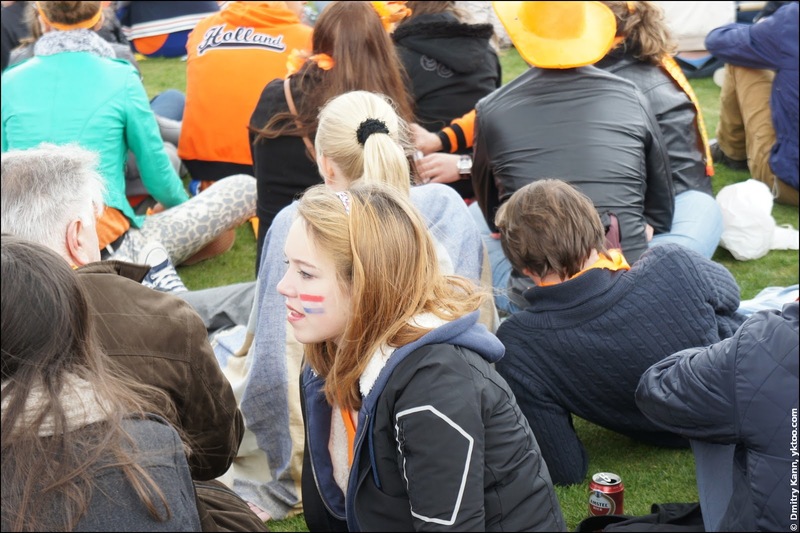 Many faces are traditionally painted in the Dutch flag colours. 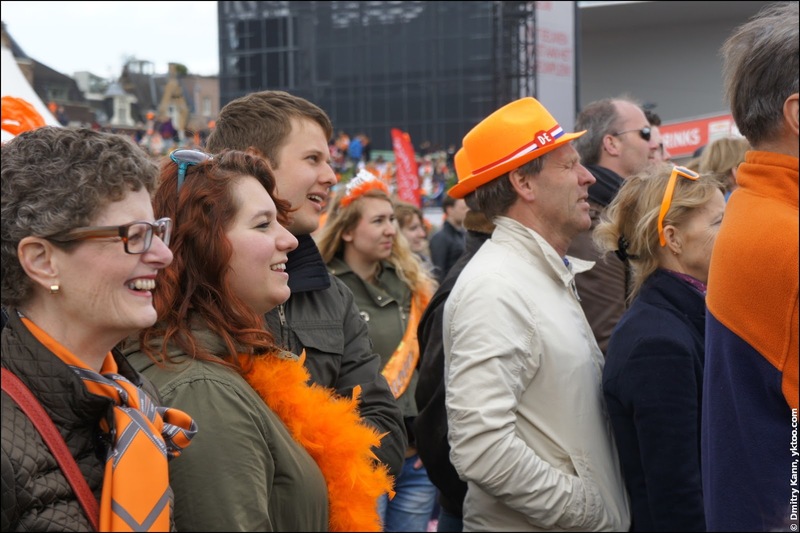 Among the Dutch, there were quite a few foreigners who felt engaged. Just like us. Máxima is wearing blue, as three their daughters do. Those latter are patiently taking the duties caused by their origin. 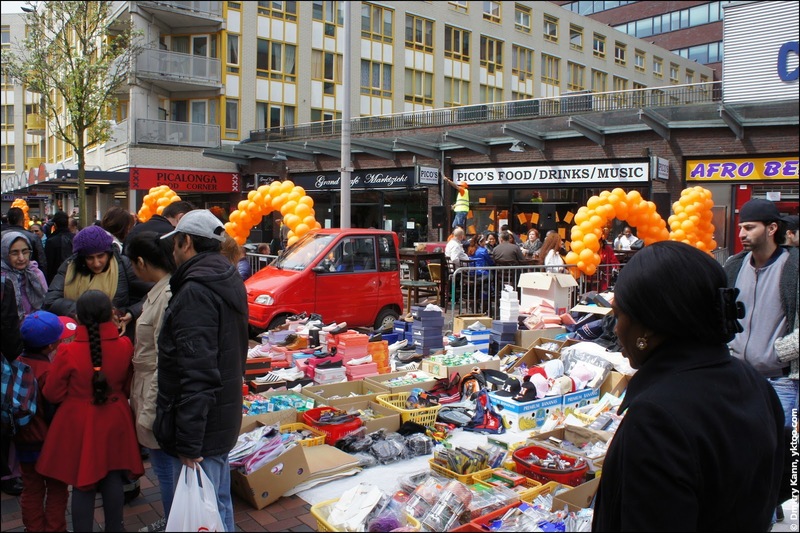 The atmosphere is very friendly, and the people are cheerful. 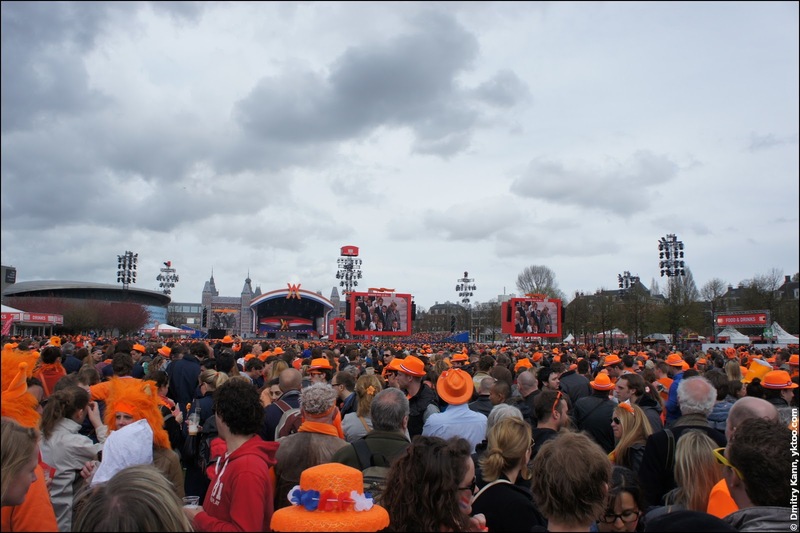 The Dutch royal house is as popular as ever. The ceremony finished about three o'clock. People began to leave. 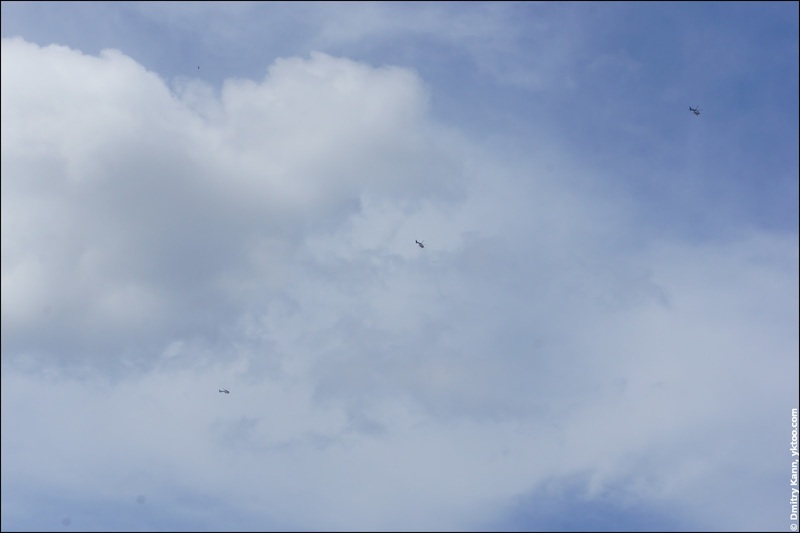 Three police helicopters hang high in the sky, monitoring public safety. 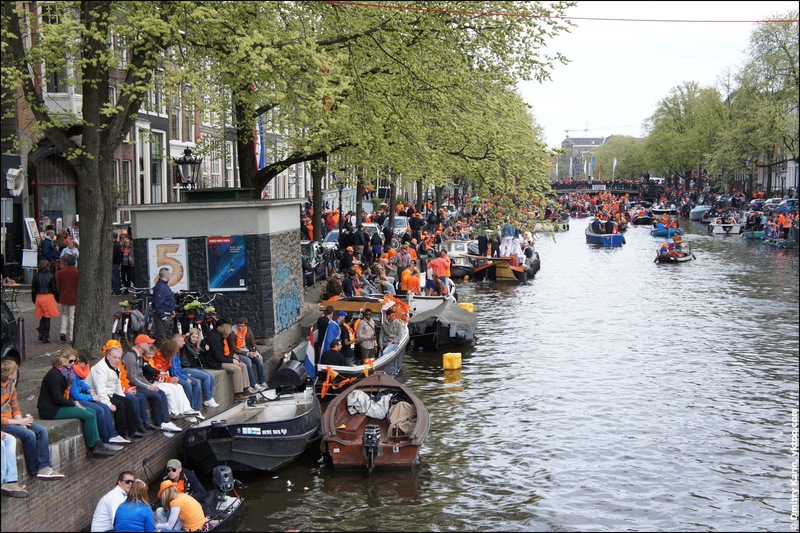 Every canal in Amsterdam is swarming with boats, full of speakers and drunk youngsters, who greet the new king. It's incredibly crowded in the streets. We had to detour several times because it was nearly impossible to squeeze our way through the crowd. 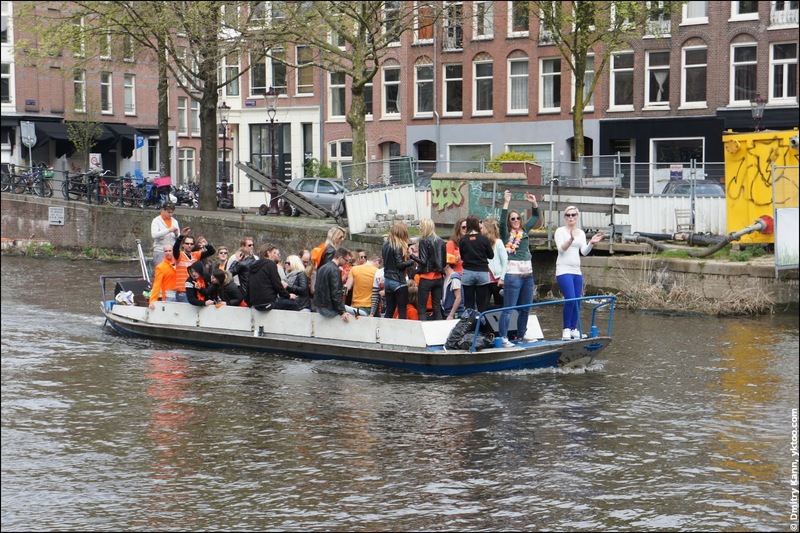 As an addition to floating speakers, every street was producing some noise. Here are banners of War Child and speakers below them. 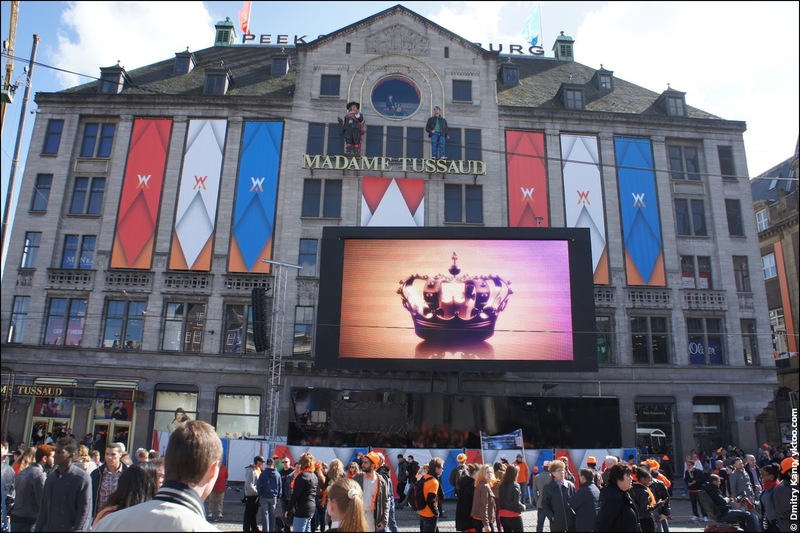 The last Queen's Day. At least until Amalia assumes the throne. 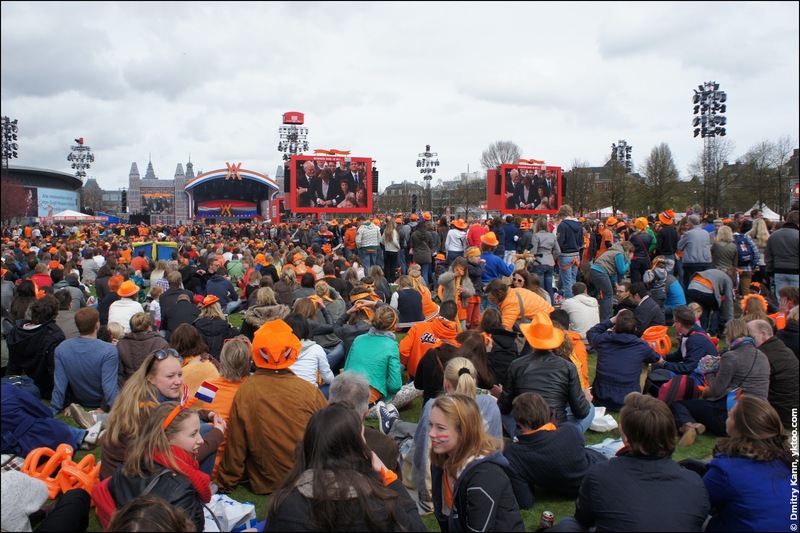 Unless (and I find this highly improbable) the Dutch Monarchy ceases to exist earlier.